PROTHERM, LLC can supply an energy efficient oven to use with your overhead conveyor. The oven can be made to support the conveyor track inside the heated chamber to help contain heat and fumes, or to have a slot on top to for part hangers to pass through. Ovens have been built with part profiles as small as 4”x12” to as large as 8ft x 11ft. 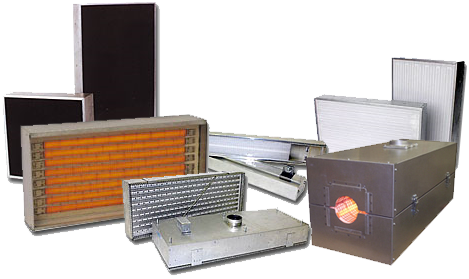 A variety of Protherm, LLC built electric infrared heaters can be used to efficiently heat the parts. They are environmentally friendly and can be precisely controlled, zoned, and arranged in the oven to direct the infrared energy to the part where it is needed, saving you energy dollars. Protherm, LLC ovens and control panels are built to be installed quickly, with a minimum of field wiring required. When permitted, all systems are completely factory assembled, set up and tested prior to shipment to assure a simple trouble free start up. 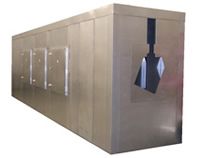 Overhead Conveyor Ovens are used in a wide variety of applications in manufacturing facilities. The most common uses are in the finishing industry for drying, preheating, powder coating pre-gel and cure, and e-coat boost and cure. For more information and advantages also see Booster Oven page. Whether it is a couple heaters on a frame to roll on line for that stubborn part, or a complete insulated oven with vestibules, we welcome the opportunity to review your process heating challenge. PROTHERM, LLC overhead conveyor ovens are a simple economical option to boost line speed, increase production, and improve quality.